When you become a parent your evenings soon turn into an endless array of nappy changes, feeds, stories and even tantrums but as they grow a little older and you do get time to yourself before bed you can certainly make the most of it. You might not be able to dash off out spontaneously anymore, well not without a babysitter well prepared, but that doesn't mean you have to sit in front of soap operas or twiddling your thumbs all night either! It's definitely not just for the gents! Grab your own controller, and headpiece if you like, and have fun. Nothing beats some competitive play with your partner or online pals and with so many consoles on the market and games you will definitely find something that you both appreciate. Whether that's a disco dance off, slaying zombies or hunting the other out as a sniper with Call of Duty, it builds bonds, creates conversation and usually makes you giggle - after a hard day at work or looking after the kids it's certainly needed. Feel good movies like rom-coms can really lift your mood and their emotive themes can leave you feeling a little bit more loved up and connected with your own loved one. Even if you are more of an action and sci-fi fan there are some great films that are worth a watch that you might ordinarily miss. Favourites here are The Vow, This is 40 and Bridesmaids. Grab some popcorn and get comfy. With great online bingo bonuses Paddypower will keep you entertained at home with the chance of winning too! It only takes a few minutes to set up an account and deposit £5 then in return you will receive £20 free play. A great activity for those unable to get out to a hall. Alternatively, if poker or pairs is your preferred game, unpack the cards and get your brain in motion. You could always use your detective skills and play Cluedo unless building an empire with Monopoly is more your style. An everyday essential but you can always spend an evening with a glass of wine (or two) making and baking something for pleasure. Cooking can be really relaxing and it allows you to be creative without leaving the home. You can explore new cuisines and enjoy sampling your tasty treats - even adding them to the kids lunch boxes for the following day. If you want to be creative in different ways you could always try crochet or knitting too - it's not just for the elderly! If you are at home most evenings due to the little ones being in bed you might want to consider a long term plan of action. Signing up for a course with Open Uni can be really refreshing and at the end you will receive a qualification which can help towards your existing or future career plans. Learn something new and exciting and develop your skills in the process. 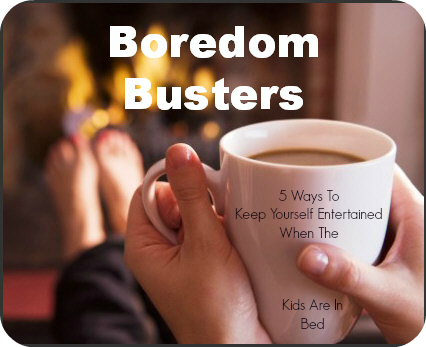 How do you beat boredom in the evenings? our mission is to have enough time after the kids have gone to bed so we can watch a movie. Rarely happens!